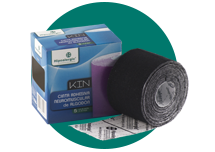 Kinesiology cotton tape, coated with a wave-form hypoallergenic and sensitive under pressure adhesive on one side and laminated with siliconed paper. Recommended for treating muscular, joint, neurological and ligamentous injuries. Suitable for reducing inflammation due to its capacity of reeducating the neuromuscular and proprioceptive system. Improves patient’s posture through sensory information, facilitates lymphatic drainage, reduces pain and accelerates the healing process at all times, allowing movement and improving circulation.